My water broke. Here I was, planning on a nice, scheduled induction, and my water breaks. During church. Although I had still planned on accomplishing much on Sunday before the baby came, we headed to the hospital around 2:00pm instead. MIL came and watched the kids (what a blessing!) and we went to have a baby! 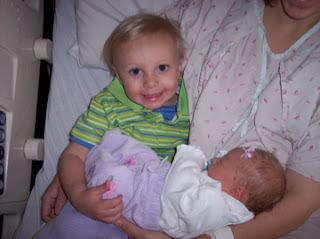 I was dilated to a 2 when we got there, but soon after the contractions started in full force. It only took me until 4pm to reach a 5, and by 5pm, I was almost an 8! 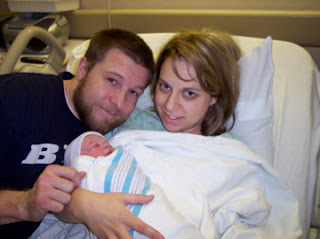 I managed until that point without meds (thanks to a great nurse and DH), but to someone who's had an epidural at a 3, getting dilated to an 8 about killed me :) They did a partial epidural at that point (pure bliss) and by 5:47pm on December 2, 2007, out she came! Since I don't do names on my blog, you'll have to just know her as the Buns or PJ (for Princess Jr). 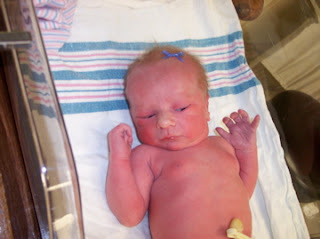 She was 6 lbs, 6 oz and 17.5" long. And healthy! She had some arrhythmia while in the belly, and she still had it when she came out, but an ECG revealed PACs (Premature Atrial Contractions), which is okay. Basically, her heart skips a beat once in a while and then does two beats in rapid succession. Healthy people have them and it could just resolve itself on its own. 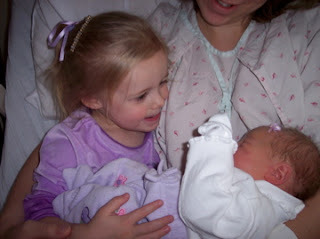 At any rate, we welcomed her into our family, awed that our Heavenly Father had entrusted us with another choice spirit. We are so grateful to have her! We spent Sunday & Monday in the hospital recovering. I had horrible cramps in my legs that really bothered me - I would shake and shake. But the doctor said it was just from my uterus contractions and it was normal to be worse with each baby... Hmm... I think I'll stop at three... :) The Bubbs and the Simster came to welcome their new sister, and Oma & Opa visited as well. We had to get PJ's bilirubin levels tested as well (for jaundice) and because the levels were high, we tested again on Wednesday & Thursday to make sure she was okay. Another blessing - her levels went down on Thursday and she's doing fine! We came home on Tuesday and have spent the rest of the week getting acclimated to our new addition! For the most part, the kids have been great with her. But I definitely think three is harder than two - even with DH home, there's always somebody who can't be held :) Hopefully I can adjust and be a good mom to all three of my cuties! I am so grateful to my Heavenly Father for the beautiful girl He sent to our family! Oh, Sharon, I'm so excited for you! I have been wondering how you are. I can't believe your water broke at church...when and where? Did you about die?! I would have. I'm just thrilled for you and the new little one. Wow she is Precious and Beautiful CONGRATULATIONS! I talked to your husband on Sunday and got some of those details about her name and stuff, that is so neat! I hope you are doing well...let me know if I can help in any way! Don't worry you will adjust to 3 Mom's always do! She is so beautiful. I am so thrilled to have a new niece! :) What a sweet spirit she has...I can tell by the pictures. Love ya.